Golden Apples: What have I been up to? All the tiles (a mix of falling off, pepto bismal pink and (repaired/replaced from a long ago--before she owned the apartment leak-- bubble gum pink) have all been resurfaced, all the visible stuff (walls, shower curtains, vanity, sink, towels) covered or replace.. and a whole lot of the invisible stuff, too. BF's work includes replacing the old knob (valves) and shower controls.. in addition, she had all the tile walls covered as well. This required removing the old vanity/lav.. and replacing. The unexpected –(are problems really unexpected when doing work on 50 year old plumbing?) problems resulted with a visit from the plumber (Dennis) and new drain/trap/overflow valve for the tub and and a new trap for the sink. There are still details to be done.. (like a new coat of paint on the walls (there were old “stuff' mounted on the walls,--and voids now (unpainted) left over from the removal. But the bright, clean white surfaces, make the bathroom look great already.. (the bathmats I made don't perfectly match the new towels, but are a great match with the shower curtain.--giving a co-ordinated, but not excessively so –look to the space. When the room is painted, and all the cloth accessories add, I'll post another photo. I cast on using one of my most recently learned cast ons.. an Open/closed cast on that uses a doubled strand of yarn for the tail.. It looks pretty, its very stretchy, and it's easy to do. AND I also go this--> it doesn't look like much now.. It is part of the 'waste 'acrylic tub wall line.. (these pieces were cut outs for the soffit and window ) it's about 2 mils thick--stiff, --but not rigid... and easily cut with an electric 'jig saw' (a tool I own) the larger piece is 13 inches by 30 inches. Come the spring (I know-- it's spring like now.. but in a few weeks) it will be cut into 2 or perhaps, if I am lucky, 3 pairs of sock blockers... It cuts 'dusty' –so I want to wait till its warm enough to comfortable work outside for a while. It was un-labeled, but very similar in weigh/style as Garnstudio's Silké-which I have only seen in solids.. (I haven't checked GarnStudio's web sight to see if Silké is available in colorways) There wasn't enough to make a full scarf.. but the 3 'tails' in the old shale pattern-make a pretty front.. and the back of the neck is simple double knit stocking knit.. 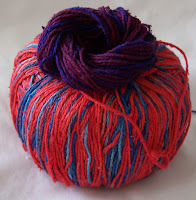 I have more of this yarn (600+ gms) in a different ( red/blue) color way that doesn't 'send me" --so I took a bit and tried over dying.. the scrap ended up too dark--but-- I think adding more blue/purple is the way to go . Baths or babies. Everybody I know is either re-doing their bath or having a baby. We just put in a new floor and vanity in ours. I'm still searching for the right countertop. Maybe it's because I didn't have to live with it, but I for one liked the pink.